Leaving Edinburgh on Thursday night under a perfect blue sky, a small but hardy contingent headed to Corpach for a long weekend's camping. 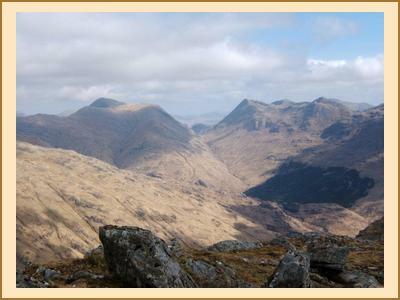 After an abortive 4 am start (in the hope of some winter climbing) Friday saw assorted parties heading to Glenfinnan for a delightful day's walking and scrambling in this inexplicably ignored area of Scotland. Upon their return more members had arrived making this one of the best attended camping meets in a long time, so we retired to the local hostelry for a celebration. 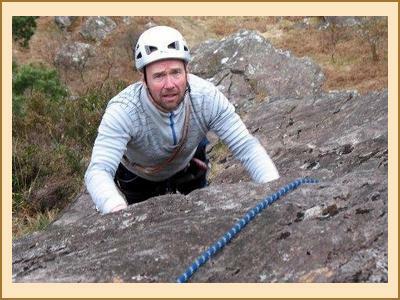 Saturday saw the re-emergence of climbing as more than half the group headed to Polldubh for a days cragging, the highlight being Kenny's ability to charm Mick Tighe's wife into retrieving a stuck nut of his on Damnation. Mick himself had previously failed to extricate it but did the placer the honour of deeming it worthy to be clipped. In order to be fashionably late for dinner Ann, Gillian and Alison W headed off to meet a few Corbetts and there were reports that other members managed a strange sport known as sunbathing. Sunday saw Tim and Ewan heading off in search of the Great Ridge of Garbh Bheinn, having eventually found it the weather then broke and they retreated home after a few pitches sadly depriving the EMC of a guaranteed epic. Meanwhile those not heading home returned to Glenfinnan for some of the more remote corbetts and grahams and by the end of the day only three members remained under canvas.